Studies at the VMU Faculty of Informatics are not limited to the acquisition of traditional knowledge on informatics and mathematics, thus they attract not just those interested in computers, formulas, calculations and algorithms or programming. The faculty is oriented towards universal education, as the studies include the knowledge related not only to the particular specialty, but also to other sciences which share common ties with informatics. The students expand their horizons and become educated personalities, able to creatively apply modern instruments of informatics and mathematics in professional practices of various areas. The faculty offers BA and MA degree study programmes, adapted to the needs of modern society. In addition to gaining the most important knowledge of informatics and mathematics, the students also learn to apply it while modelling business management decisions, designing services to the users of modern networks, creating virtual reality and virtual communities, analyzing language texts and sounds of music, composing images or imitating thought processes. Alumni of the faculty, now working as programmers, system administrators, researchers, analysts, project managers, company CEOs and at other positions, claim that the main advantage of studies at the VMU Faculty of Informatics is the wide span of the presented knowledge, which transcends the limits of the specialty. Students of the Faculty of Informatics are provided excellent studying conditions with modern computer labs, a library, research labs and centres. An opportunity to improve the skills acquired at the university is provided by the LLP / Erasmus student exchange programme, giving a chance to study at universities in the European countries for one or two semesters. Together with faculty teachers and researchers, the students are able to participate in scientific and utilitarian projects, supported by national and EU funds. Research results are used to implement information society development projects, which are considered very high priority by the European Union. The range of research activities is wide enough for the students to choose one according to their own interests. 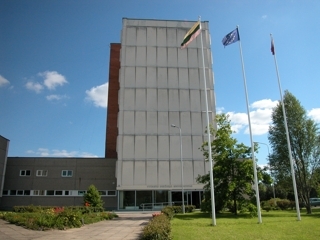 Modern equipment is used at the laboratories of Computer Controlled Systems, Internet and Mobile Solutions and Multimedia, as well as the centres of Computer Linguistics, Energetic Security Research and other labs or centres. The faculty regularly organizes seminars of presentations by students, lecturers, alumni, doctoral students and guest lecturers or business representatives. One of the aims here is to link the theoretical knowledge to relevant examples of its application; therefore, the faculty maintains close ties with scientific research institutes and advanced companies of information technology, telecommunications and other areas. The graduates of the faculty have brought themselves together into a club of the faculty’s Alumni, actively communicating with the university’s community and introducing the perspectives for work in their companies, sharing their experiences, inviting students to come on internship. For the future university students, the faculty organizes open days. Pupils of gymnasiums and high schools are also invited to the annual quiz event IFtorina. The participants of the quiz can test their knowledge of informatics and mathematics before applying for studies at the university, try their luck at a creative contest of homework and get to know the life of a university student. High school students are also invited to events organized by VMU and the ITMC Computing Academy and the summer camp for high school students at the Faculty of Informatics.